2014 truly was a year for Jack O’Connell to showcase his acting talents, and last weekend I finally got to appreciate a brilliant film of his, courtesy of Amazon Instant Video. 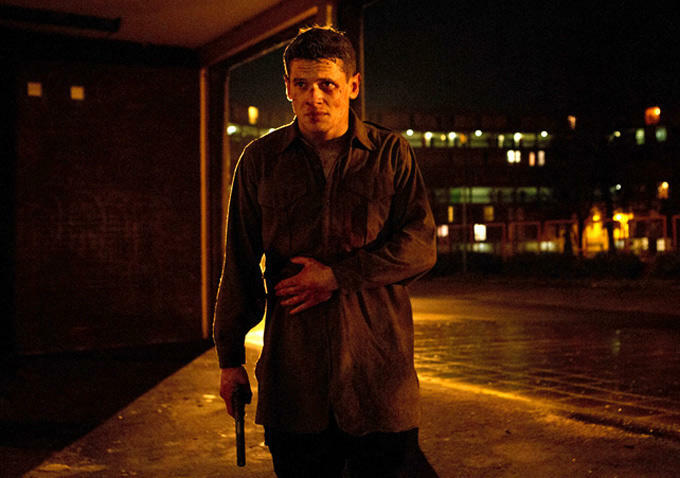 O’Connell plays Gary Hook, a young British soldier whose unit is deployed to the deadly streets of Belfast during the Northern Ireland riots. Forced to lose his uniform and try his best to blend in with the crowds, Hook must stay alive and fight his way back to his barracks on a night when he cannot tell friendly from foe. Is there really anybody he can trust? Other than the brilliance that is O’Connell in this feature film, the cast is full of past and up and coming Irish talent such as Corey McKinley, and also well decorated actors such as Sean Harris (MISSION IMPOSSIBLE: ROGUE NATION, HARRY BROWN). The twists and turns which we see in these actors’ characters throughout pays true credit to Gary Hook’s confusing and frightening experience from start to finish. ’71 is an intense and exciting watch which is enough to frighten any British or Irish viewer (young or old). Debutant feature film director Yann Demange (Director of TV series TOP BOY) makes a younger generation realise and an older generation remember the levels of divide which once threw a nation into chaos. What we see in this feature film depicts the fear and scales of violence that once engulfed the streets of Belfast, and it is definitely one which should be watched by anybody interested in the history of Great Britain. Recommendation: Definitely an Amazon Instant Video/Sky Movies listing that needs to be watched! If you’re a big Jack O’Connell fan it is also obviously worth a purchase.